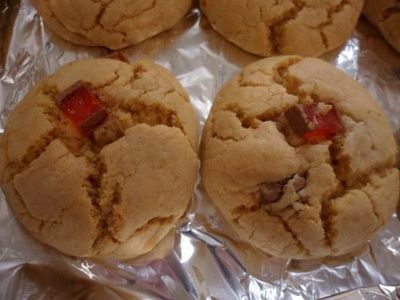 The PB&J sandwhich turned cookie form! 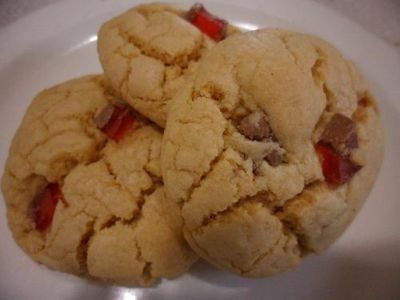 Peanut butter and jelly cookies bring turkish delight into the kitchen to create a delicious nutty treat. 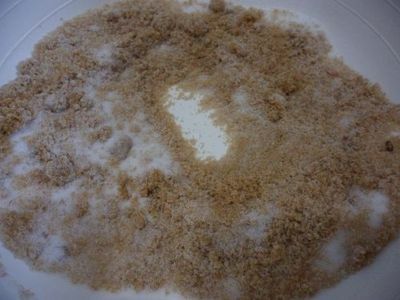 In a bowl, combine the brown sugar and caster sugar. 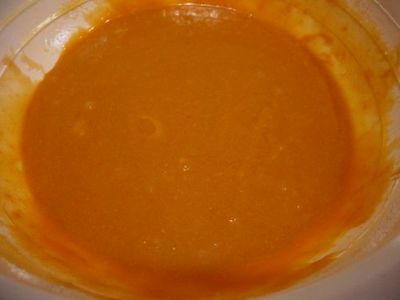 Place the butter in a microwave safe bowl and melt on high for 40-60 seconds. Add the melted butter to the sugars and stir through until completely combined. Whisk the eggs and add these to the sugar mixture. Beat through using a fork or whisk to combine. Stir through the vanilla and peanut butter until the mixture forms a smooth, runny mixture with a uniform texture. Using Smooth or Crunchy peanut butter is entirely up to you. Smooth will give that perfect peanut butter taste, while crunchy will do that and add some extra chunks and texture to the cookies. Sift the flour into the peanut butter mix and stir through to form the cookie dough. Chop the turkish delight into small chunks, about half a centimetre squared. Add these to the peanut butter cookie dough and fold through so that the turkish delight chunks become embedded within the dough. Keep some chunks spare to use to top each cookie with. 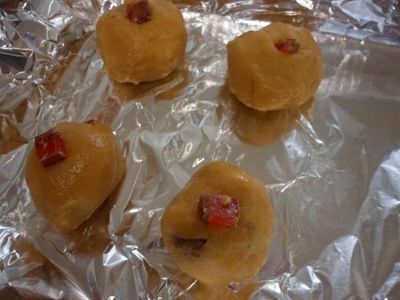 Use some extra flour to roll the cookie dough into small balls. 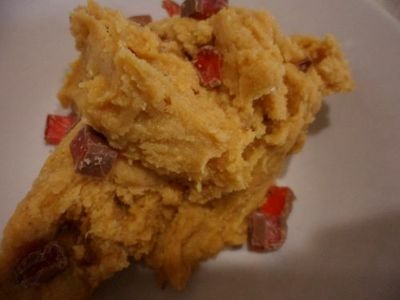 Place the cookie dough balls onto a greased baking tray and top each with a chunk of turkish delight. Bake for 20-30 minutes, or until cooked when tested with a skewer. The cookies will from cracks in their tops as they cook completely. Take out and cool on a wire rack, ready to devour! If you want to save some cookie dough for later, roll the remaining dough into a cylinder shape, wrap it tightly in cling wrap, and place it in the freezer. Simply take the dough out and let it thaw enough to slice pieces from whenever you next want to bake some cookies. Place the slices onto a baking tray and bake as normal, or until cooked through! Best music venue in Melbourne?